Almost 20 cupboard-sized “3D printers” stand in the new production hall of citim GmbH. There are flashes in the machines: A laser heats metallic powder to a good 1,000 degrees Celsius. By means of depositing and melting the material, a three-dimensional object is built up on the basis of digital 3D construction data. This way, layer by layer, a metal part grows which could not be manufactured at all using conventional processes. The “printing” of a particularly complex part can last up to two weeks. For the customers of citim, however, the additive production of prototypes or small batch series is worthwhile. Because product development and market launches can be decisively shortened with tool-free production. citim has now been specialising in rapid prototyping, additive production and small-series production for around 20 years. As a service provider it covers the whole production chain, from the designing the part to its production, regardless of whether it be made of plastic, metal or composite materials. For this, the company invests again and again in the latest technology. In November 2017, for example, the world’s first so-called XJet machine was installed at citim. With this inkjet-based technology, the 3D printing experts from Saxony-Anhalt can now also manufacture ceramics additively. Most recently, in October 2017, CLIP technology (Continuous Liquid Interface Production) was introduced in the shape of new machines from the company Carbon. With these, extraordinarily short construction times can be achieved in the production of parts made of liquid polymer by means of continual irradiation with ultraviolet light. This allows substantially higher quantities to be made, in almost series-scale production. It is important for the globally active service provider citim to offer this technology because additive manufacturing is increasingly finding its way into series production. More than virtually any other company in the world, citim has a mastery of the still young technology of additive manufacturing. “Citim works for very innovative companies. Our customers come mostly from the fields that are developing new products and have the courage to use new production technologies,” says Andreas Berkau, Managing Director of citim. The clients include machine builders, aircraft manufacturers and electric companies; the automotive industry and suppliers have parts “printed” for exhaust systems, pumps and drive units. One example of a very special, additively manufactured part and of the advantages of the technology is the antenna arm of the Sentinel 1 satellites of the European Space Agency ESA. For the earth observation satellite, citim’s experts have, together with partners, optimised the antenna arm for a riveted, multi-part sheet metal assembly for metal 3D printing. For example, the part’s original weight of 1.6 kilograms was almost halved - while retaining the same strength. Daring and innovation have characterised this company from Saxony-Anhalt since it was founded in 1996 as a spin-off of Otto von Guericke University Magdeburg. The Innovations- und Gründerzentrum (IGZ) in Barleben, a borough in the immediate vicinity of Magdeburg, the capital city of this eastern German state, offered ideal conditions for growth. At first, citim focussed upon prototype tools, which is to say the development of tools with which conceptual and functional prototypes can be manufactured. The portfolio was continuously expanded with new technologies, however. The middle-sized company has already been conducting research projects into additive parts manufacturing since 1999. Laser sintering, the additive manufacturing of plastic parts, was then introduced in 2004. At that time, the subject of 3D printing was still absolutely new territory. Another milestone was the introduction of laser melting in 2009, which is to say the additive manufacturing of metal parts. citim has now even become the world industry leader in this field. This company from Saxony-Anhalt, which has also had an affiliated company in the USA for four years, would now like to expand this position to create a large market for additive manufacturing. The expertise of the 3D printing specialists from Saxony-Anhalt attracted interest: citim has been part of the Oerlikon concern since January 2017. Among other things, Oerlikon supplies the metal powder that the eastern German specialist company uses for metal 3D printing. There is a clear strategy: the globally active Swiss technology concern wants to become global market leader in the field of surface solutions and materials processing. With a tradition going back more than 100 years, the company is present at over 170 sites in 37 countries, with more than 13,500 employees. 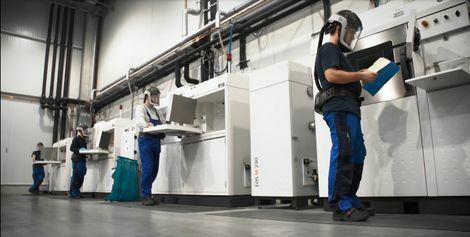 “As part of the Oerlikon Group, citim will be in a position to offer its customers all over the world extended technologies and competences in the field of additive manufacturing, as well as comprehensive services along the value chain,” says Frank Lehmann, also a managing director of citim. For example, in future, all process steps in additive manufacturing could be offered from one provider. “We are convinced that, in combination with Oerlikon, we can accelerate the industrialisation of additive production and strengthen our profile as a globally leading service provider in the field of additive manufacturing,” says citim Managing Director Andreas Berkau.